Against the Grain is a small-scale diversified farm located 15 minutes from downtown Boone in Zionville, NC. We live on a 35 acre farm where we raise a broad spectrum of Certified Biodynamic and Organic vegetables on a little under 2 acres. We also raise Animal Welfare Approved pastured chicken, turkey, pork, beef and goat. Our vegetable production methods are in transition from a more traditional cultivation approach to a reduced tillage/no-till approach. We build compost on the farm and focus on single-source inputs instead of formulated fertilizers. We also have a team of draft horses that we are beginning to incorporate more into the farm. We are primarily a direct market farm and focus on three main season markets (weekly farmer's market, CSA and restaurants). The 2018 season will be our seventh season in crop production and fifth year in animal production at our current farm place. We are continuing to refine our crop rotation, cover crop management, harvesting and composting techniques. Our focus at Against the Grain is to nurture the soil in order to grow high quality, nutritious food for our local community. You can find our products at the Watauga Co. Farmer’s Market, the Boone’s Winter Farmer's Market in our Veggie CSA, in our Meat CSA, distributed by New Appalachia Foods, as part of the the High Country Food Hub and in select High Country area restaurants. We raise beef, pork, goat, turkey and chicken. We grow a small amount of sorghum for molasses and heirloom corn for cornmeal. You can find our products at the Watauga Co. Farmer’s Market, the Boone’s Winter Farmer's Market in our Veggie CSA, in our Meat CSA, distributed by New Appalachia Foods, as part of the the multi-farm High Country Food Hub and in select High Country area restaurants. We plan to hire 2-5 full-time apprentices who live on the farm and 2-3 part-time interns who commute from Boone and typically maintain another part time job or school schedule. We are somewhat flexible with start and end times, but typically, our season gets busy around the end of March and comes to a close by the end of November. The time commitment will vary through the season at 45-65 hours per week. The beginning of the season is very busy and as the summer progresses there is a steadier rhythm that sets in. For apprentices who would like to live on the farm, we expect a commitment for the entire season. Apprenticeships generally involve learning by doing. In the process of doing the work of the farm, apprentices will have the opportunity to gain experience in planting techniques, soil fertility, weed control, pest management, irrigation, harvesting, marketing, equipment use/maintenance, record keeping and livestock management. Some tasks may seem redundant or monotonous, so it’s very important for interns to be able to maintain a positive attitude. We work in all types of weather conditions, so come prepared with a variety of appropriate attire. It is essential for prospective apprentices to understand that farm work is very physical. We do our best to vary the tasks throughout the day, in order to prevent too much time being spent on one job; however, farm work is often repetitive by nature and very physically demanding. It is important to be realistic and honest about your past work experience and physical stamina. Stipend amount will be based on experience and is negotiable, but generally, we start at $600/month. We offer a 2-week, unpaid trial period, during which both apprentices and farmers can evaluate if an arrangement for the season is mutually beneficial. If the farmers and perspective apprentices agree to continue the relationship, the start date for their first month will be retroactive to their first day on the farm. After two months, a $25/month raise can be expected. Compensation also includes 1 dozen eggs per week, 1 lb sausage per week, 2 whole chickens per month, organ meats and unlimited produce. The housing includes an off the grid shed and a camper with a common area for cooking and relaxing. We will give instructions as we go and try to explain “how” and “why” along the way. Occasionally, we will have evening discussion/films on topics including soil fertility, basic botany, and management of weeds, insects, and diseases. We also have a small farm library, to which apprentices will have full access. We are not specifically a teaching farm, but we will do our best to convey as much of our knowledge as we can reasonably, while we work. There is a CRAFT network, hosted by Blue Ridge Women in Ag, which hosts field days on farms in our area, and we strongly encourage interns to attend. There is also a weekly biodynamic/anthroposphical study group that is an option for interns. Our farm is a very active member in the Blue Ridge CRAFT network. We are located 15 minutes from downtown Boone, NC, which is a vibrant college town of 18,000 people. There are 3 breweries, multiple restaurants and coffee shops in town. The "High Country" is known for its rock climbing and hiking culture, so there are many opportunities for those who are interested. Mostly, we are interested in hiring and mentoring people who are truly interested in farming. A positive attitude, experience working in teams and an inquisitive mind is a must. Previous farming experience is a plus, but not required. Bringing your own vehicle to the farm is encouraged but not required. It is essential for prospective interns to understand that farm work is very physical. We do our best to vary the tasks throughout the day, in order to prevent too much time being spent on one job; however, farm work is often repetitive by nature and very physically demanding. It is important to be realistic and honest about your past work experience and physical stamina. To inquire about employment opportunities, please contact us by email between December and March or visit our website for further information. 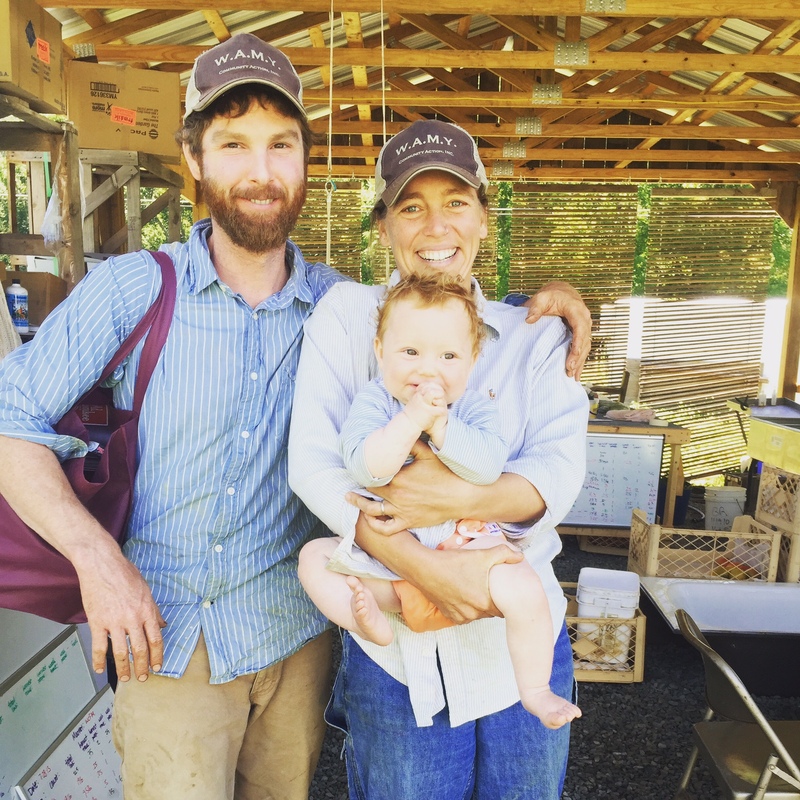 “This was a very immersive experience, I learned a tremendous amount, and was brought into the farm community in many ways through my time at Against the Grain. After my apprenticeship, I felt ready to farm for myself, and felt like I had the skills and experience to do so. We participate in the High Country Farm Tour every year and are members in the Blue Ridge CRAFT program. We have a cob pizza oven and host several pizza parties for customers and CSA members throughout the season. Find out about our current offerings on our farm’s Facebook page.